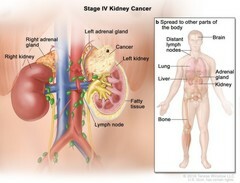 Stage IV kidney cancer; drawing shows cancer that has spread beyond the layer of fatty tissue around the left kidney to a) the adrenal gland above the left kidney. Also shown are the lymph nodes, right adrenal gland, and right kidney. An inset shows b) other parts of the body where kidney cancer may spread, including the brain, lung, liver, adrenal gland, bone, and distant lymph nodes.